Do you entertain clients or hold team building events in a corporate type setting or possibly, golf outings, cruises or even Vegas? Only to return to a hotel each evening where everyone goes out on their own and not necessarily as a “team”? Let’s do something different, something your clients or your team members will be talking about until your next corporate event! Having worked for a major corporation years ago, with clients like Whirlpool, Sunbeam, TRW, Mathews Archery, Easton Arrows, and Gold Tip we know what it takes to acquire clients like this but more importantly, what it takes to keep them. We understand that if you aren’t taking care of them, someone else will. We understand that you have to stand out and be creative when it comes to entertaining your clients. This is where Outdoor Solutions comes in, by offering custom-built corporate retreats for reenergizing your employees or events for entertaining your clients. With our numerous choices of destinations and a one on one consultation to determine your companies exact needs, we can create an experience that will stand out by not being the same old, same old outing that everyone else is doing. 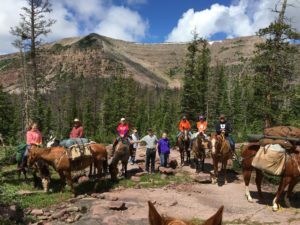 If you are looking for corporate retreat or team building experience that is not in a concrete jungle, then one of our Wyoming or Utah locations may be ideal for you. Even though we are remote, we are still very easy access from a major International airport. Once you arrive to this facility you will forget that the city is just over an hour away. 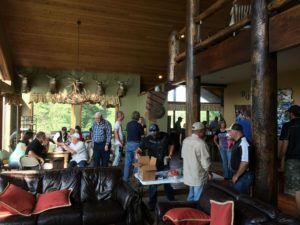 Our Corporate Retreat lodges offer all of the amenities you could expect and fully staffed with our Chef, ranch hands, cowboys, firearms instructors, hunting and fishing guides. 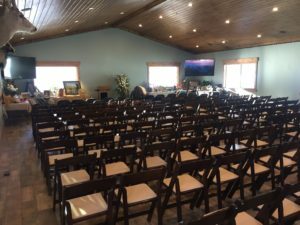 Even though our locations are remote we are still able to offer, a full conference center with broadband internet and wifi, private bedrooms with private bathrooms, separate cabins with additional bathroom facilities, indoor and outdoor dining available with views you cannot find at a hotel in town. When it comes to entertaining your clients in a hunting or fishing setting, we have outfitters that are very accustomed to providing services that will exceed your expectations and will leave your clients with memories that cannot be created on the golf course. Our hunts can include big game in camps on horseback that provide scenery which cannot be duplicated anywhere else. The back country experience is one that few truly have the opportunity to enjoy. Even though these hunts can be in some rugged country, it will be an experience like no other. Our tent camps are nicer than some other outfitters lodges, they come complete with raised wooden floors, wood burning stoves, separate mess tents for your meals and even a shower tent with a 50 gallon generator powered hot water heater! If roughing it is not your thing then one of our 5 star lodges, complete with chef and staff may be more to your liking. Our lodges still have access to some of the best big game hunting in North America. We can also do more than just put a hunt together for you. The relationships we have with outdoor manufacturing companies, gives us options of offering gear that may be needed specifically for your trip or we can even arrange a friendly shooting competition with the winner going home with some new gear. Maybe you are in need of an adventure where you have more face time with your client to help build on an existing relationship or create a new one. Some of our wing shooting lodges in a relaxed atmosphere offer some great field time behind working bird dogs in the mornings and late afternoon, while your mid- afternoon can be spent discussing business over lunch prepared by our chef or during a round of sporting clays. Outdoor Solutions can even arrange for everything to be provided, including shotguns, shells and even have coolers filled with vacuum sealed bags of pheasants from your hunt ready for your departure. Perhaps a fishing destination would be more to your liking? Outdoor Solutions offers fishing destinations that our Corporate clientele frequent quite often. One of the things our clients really appreciate about our fishing destinations is, all you have to do is show up! You don’t have to worry about bringing fishing gear, our outfitters will provide it all for you. Some locations offer remote settings where getting there is part of the adventure, think about loading up in an Otter (float plane) and landing on the water right next to your lodge or watching the guide prepare a shore lunch with Walleye you just caught that morning. Maybe something a little more exotic like Costa Rica, where you have numerous species to go after while in the comfort of the newest boats out on the market or even ask the chef to prepare your catch of the day for your next meal! If you can dream it up, Outdoor Solutions can make it happen. Your success is our success. To start planning your next Corporate retreat or corporate hunting/fishing adventure, call the Outdoor Solutions office.